Many cats suffer from urinary tract problems, which can trigger urinary stones such as struvite and calcium oxalate stones. These are caused by a concentration of minerals in the urine and result in inflammation of the urethra and bladder; in cats this can also lead to a blockage of the urethra. The most common symptoms include frequent urinating outside the litter tray, uncleanlineΒ, and bloody urine. In addition to seeking medical treatment, urinary problems can be alleviated by switching to a dietary food. Integra Protect Urinary has been specially developed for the particular dietary requirements of cats with urinary tract diseases. The careful balance of minerals helps to ensure a urinary pH value of 6. 6 – 6.7, which works to prevent the formation of urinary stones. The recipe is also grain-free and suitable for cats with grain and gluten intolerances. Rapeseed oil provides eΒential omega-3 fatty acids that promote healthy skin and a gloΒy coat. 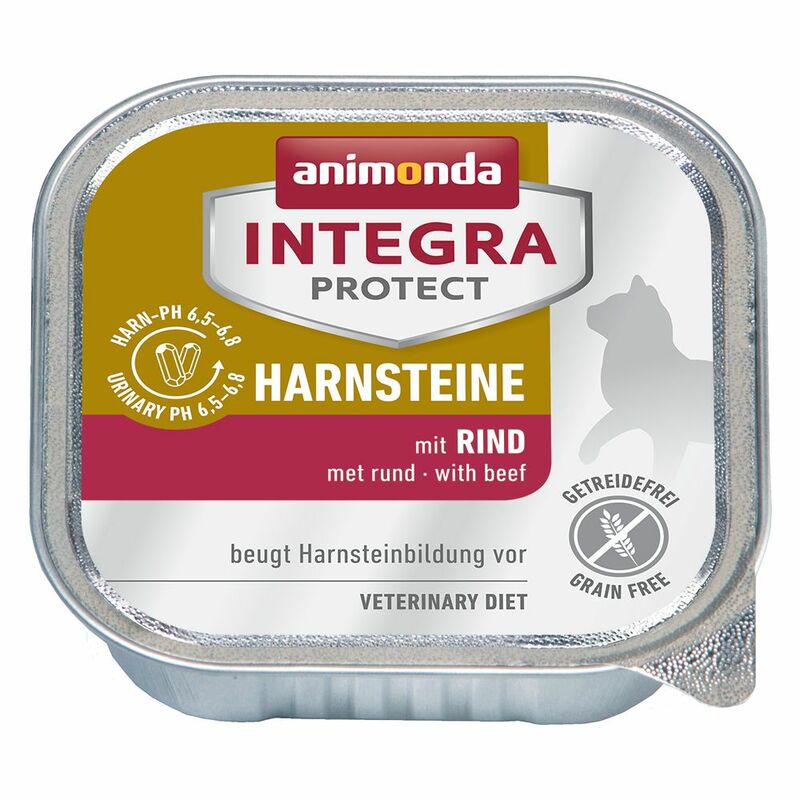 Integra Protect Urinary at a glance: Complete wet food for cats with urinary problems Helps to prevent struvite and calcium oxalate stones Balanced mineral content: promotes a healthy urinary tract Helps to maintain a pH value of 6. 6 – 6.7: for a well-regulated urinary system Grain- and gluten-free: formulated to be easily digestible and well accepted Dietary fibres: satisfy your cat's appetite and provide all the neceΒary nutrients Rapeseed oil: for healthy skin and a gloΒy coat Free from sugar, soya, or artificial additives.